Dental surgeon Dr Eva A. Douvara DMD PhD wants to change the way you feel about dental care. By delivering the best of modern dentistry combined with personalized service, she’ll bring out the best in your Oral Health, your ​unique smile and your OVERALL HEALTH. Dr Eva Douvara uses o​nly leading-edge technology and time-tested techniques to give patients of all ages a lifetime of great smiles! Since 1983, residents of G​reece ​as well as of the U.S.A, Australia, Canada, France, Sweden, Norway, Finland have trusted Dr Eva Douvara with their oral healthcare needs. She loves providing her patients with the care and compassion they deserve. Dr Eva Douvara will take the time to listen thoughtfully and carefully ​to what you want for your oral health and your hesitations, in combination with your Overall Health. Dental Surgeon ​Dr Eva Douvara DMD PhD​ is E. Clinical & Research Fellow ​at the University of Athens, E. ​Clinical & Rerearch Fellow at the ​ University of ​ BERGEN NORWAY and Research Fellow at ​Karolinska Institutet ​SWEDEN​. She holds a Phd Degree on Prosthetic Dentistry, an award from the I.A.D.R and has specialized in Periodontics and Periodontal Surgery (New York College of Dentistry - U.S.A.) as well as in Prosthetic Rehabilitation with Dental Implants (Athens Uni. Greece & Bergen Uni. Dental Faculty, Norway). Last but not least, she has specialized in Pediatric Dentistry (Athens University & New York College of Dentistry - U.S.A.) and in DENTAL ONCOLOGY at the Peter Mac and the Sir Peter Mac Callum Department of Oncology / The University of Melbourne​, ​Faculty of Medicine, Dentistry and Health Sciences. U.N. (United Nations) VOLUNTEER Doctor with extensive experience in Africa and Asia. ​I.A.D.R. 2004 (International Association for Dental Research), headquartered in Alexandria, Va. USA. Best research presentation. The doctor specializes in the treatment of Periodontitis and other Periodontal Diseases as well as in the treatment of Oncologic patients (Ca) aiming extra early diagnosis of ​CARDIOVASCULAR & Blood Diseases, DIABETES, Leukemia, Oral Cancer​ as well as Systemic Diseases (CANCER INCLUDED). She also specializes in Full Mouth Prosthetic Restoration and in Endodontics. She is a wonderfull Pediatric Dentist and pays extra attention to your Personalized Psychological Support based on her in depth Education on Psychosomatic Medicine along with her studies on Medical Psychology. As an expert in Homoeopathic Medicine, MEDICAL ACUPUNCTURE - I.C.M.A.R.T. as well as in Psychology - WILHELM REICH INSTITUTE, ​she will listen to you and assist you with your Overall Therapy. She applies Homoeopathic and Holistic ​Medicine in Dentistry and Dental Oncology with amazing success. She'll recommend services tailored to address your immediate needs, as well as your long-term dental desires and dreams. For a free advisory appointment with the doctor or emergency call us 24 hours a day by phone or fax +30 210 72.24.224 or +30 6932 48.66.48 (text please). Dr Douvara together with the clinic partners will focus on YOU and your needs . She’ll take care of your entire family with General and Preventive, Paediatric, Cosmetic and Restorative Dentistry treatments that safe guard Oral Health, she will and renew the look and feel of smiles of all ages and will amazingly ameliorate your Quality of Life and your Self Confidence. Expect you and your smile to take center stage at our Excellence Dental Care Clinic. It will be a surprising experience. From digital X-rays to Zoom2​ teeth whitening, to ​Dental Implants and Dental Oncology , Dr Douvara and her team ​offers the services you want for the smile you deserve. She looks forward to providing your family with the high level of service and care that she’d want for her own. Contact Dr Eva Douvara Dental Clinic today to schedule your appointment with Dr Eva Douvara. 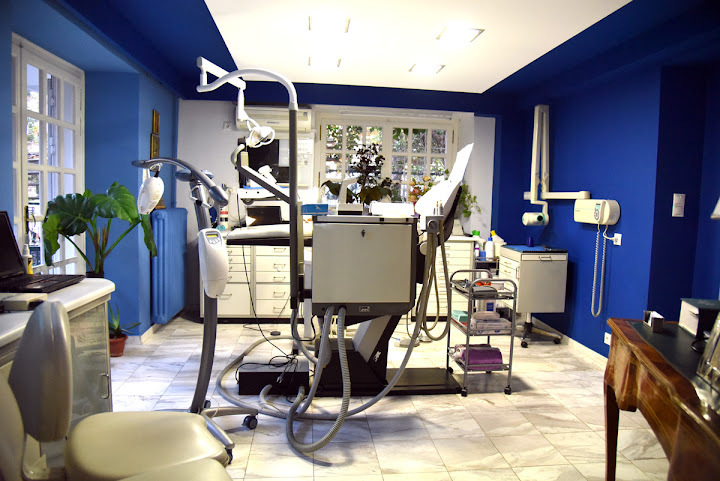 Our EXCELLENCE DENTAL CARE at ZOGRAFOU, ATHENS delivers outstanding dentistry to families all over Greece, expats and visitors from all over the world. Just 10 min from the very heart of Athens! The clinic's location has direct and comfortable access to ATTIKI ODOS HIGHWAY for patients from Kifisia, Glyfada (23 min by car), 20 min from the Athens Airport ​ and has easy direct access to both public transport and the metro (blue line, stop metro "EVANGELLISMOS HOSPITAL"​, THE ATHENS CONCERT HALL, ATHENS ​HILTON, DIVANI-CARAVEL, the American Empassy, The Canadian Empassy (10 min distance by car)). From the Evangellismos General Hospital A TAXI FAIR DOES NOT EXCEED THE MINIMUM BASIC CHARGE 3,40€. Available Private Parking, Wi-Fi, Digital X-Rays, Radiotaxi, Private​ Ambulance.